I would love to hear Jake’s selection of a Springbok 15 plus reserves at this point. Key areas I’d like to know would be backline and their backups, and how he would go with the locks and loose forwards. I think for a World Cup winning coach the guy got a raw deal from SA like few before him. I would like to take it even further and have him name a squad of 31 presuming everyone was fir. Yep, still think he’s one of the best coaches around. PDivvy inherited his team and got the kudos for it. I am afraid you are confused. If Strauli coached the team for 2003 and Jake won the World Cup in 2007, how did De Villiers fit in between? He coached from 2008 to 2011. Those are the facts. Your wrong bud . 2007 jake white won the World Cup . 2008 pdv took over . He coached the side to the 2011 WC in New Zealand where we lost to Aus in the QF . What!!! Jake, then Divvy, then Heyneker…about those facts? I agree that he is one of the best SA coaches, no the best coach ever. What I dont appreciate is the fact that you dishonour Pieter. We can say the same for HM when Alister took over a Bokteam with a bad reputation and Rassie riding the wave after Alisster did the groundwork. If Pieter is so good why hasn’t he been snapped up by a top club or some other country,- sorry to burst your bubble mate but people in the know have a real appreciation for a coach’s talent or lack thereof, if Pieter was any good he wouldn’t be coaching Zimbabwe. It’s an open secret that the players from Jake’s era led that team when Pieter took over, he did nothing but spout nonsense to the media making an even bigger fool of himself. Because he is like you. Say what he really thinks. If you say he is fool then I would like to know what it makes you. You need to stop thinking that certain a top job is for certain persons. You dont have problem,your are the problem.If the fool knows how to beat the AllBlacks then keep him as the coach. I didn’t start with “Pieter” Barry, if you read my post I called him Pdivvy. The “Pieter” was in response to Maxwell who called him that,—please do try keep up. As I recall Pieter De Villiers never coached the Springboks, he did consult though as a scrum coach for a bit. There was a certain Peter De Villiers, perhaps a Knob moment? and us the supporters don’t make it any easier. I have had many ups and downs with Jake. One month he’s the greatest coach on the planet the next he should be fired. South Africans must be the most fickle supporters in sport. 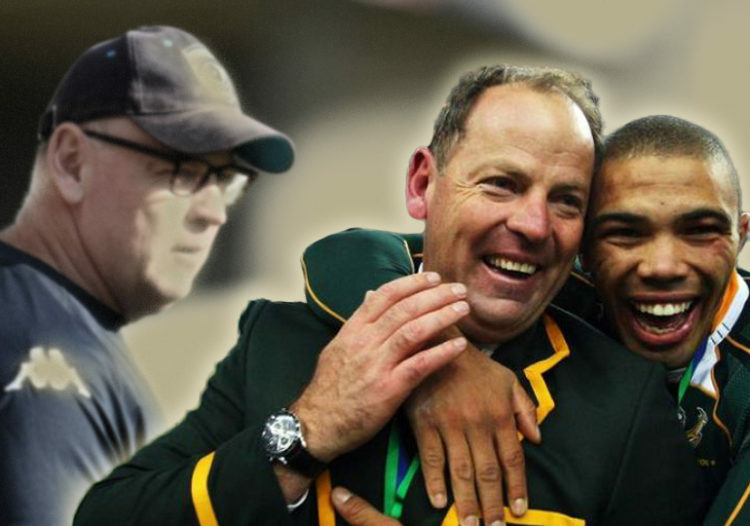 I guess that is why they say the Bok coaching job is the most difficult of them all. It just highlights the vital role played by professional coaches in the modern game. What in the past was often put down to poor on field play, can now clearly be ascribed to shortcoming in coaching. There is no place to hide! What wasn’t fully elaborated on though, was the role that professional management play in keeping coaches motivated and on their toes and having the strength of character to make changes timely, when it become apparent that the coach is not cutting it! We have some examples of this currently – as the adage goes, that players don’t pick themselves, so it can be said that Coaches don’t hire themselves! Is it not also time that we started acknowledging the role that administrators play in making a team successful. So often it is either the players or coach that gets fired, but the administration survives! Been trying to tell you that this is the problem at the Stormers for yonks,-glad you’ve finally seen the light. Yes, but a little closer to the action than you make out!! Gert Smal has watched this fiasco go on for four seasons now and still has not made a change! Fingers are pointed at Fleck, but as I said above, coaches don’t appoint themselves! The Stormer’s issue is current, but let’s face it the Bulls had this problem a few seasons back and how long did SA Rugby linger before they realized that Coetzee was floundering? It is all about the money. The moment Wakefield and his board rejected Mitchell as coach, Smal lost all his power. From that point onward he was a figurehead. Now they are broke and can’t afford a proper coach anymore. That probably happened because they appointed a poor coach. Fans like winners. A losing side does not fill a stadium. Mike appreciate circumstances are difficult, but I think people let Smal off the hook a little easily. He could for example just have swopped Dobson and Fleck around. No additional cost and no recruiting. It would have made a difference and would have given the support base some hope. Certainly better than just doing the same broken thing year after year!